A ready to use seasoning for crusty bread, pasta, fish, pork or poultry. 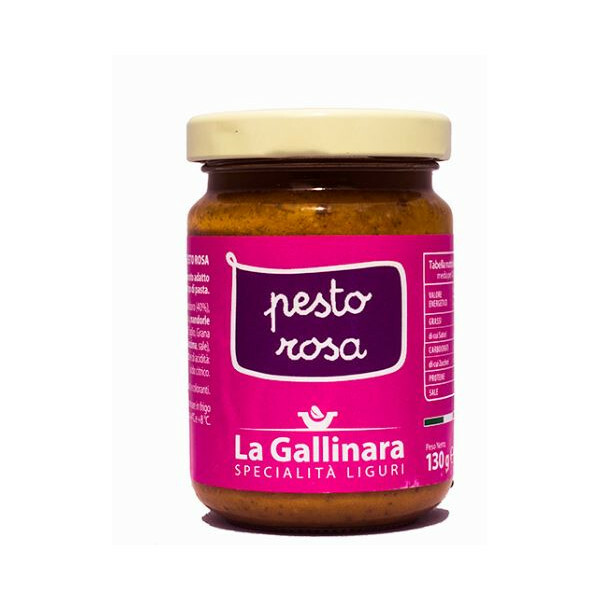 The Pink Pesto of La Gallinara is an aromatic and delicate pesto made of basil and almonds with a light hint of pink pepper. It is a classic of Mediterranean cuisine to which it is added tomato sauce that gives it the pink color. 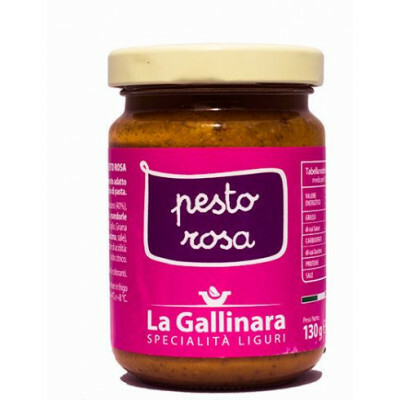 It is said that this pesto is the result of the union between a typical Sicilian sauce and the Genovese pesto, that occurred between seamen from Trapani and Genoa. Tomato pulp (40%), extra virgin olive oil, almonds (20%), D.O.P. basil, garlic, Grana Padano cheese (milk, rennet, preservative: lysozyme from egg, salt), salt, pink pepper, acidity. Regulator: citric acid. 18 months. Once open, store in refrigerator covered with oil. It is perfect to season every type of pasta, but also as the base of delicious starters.